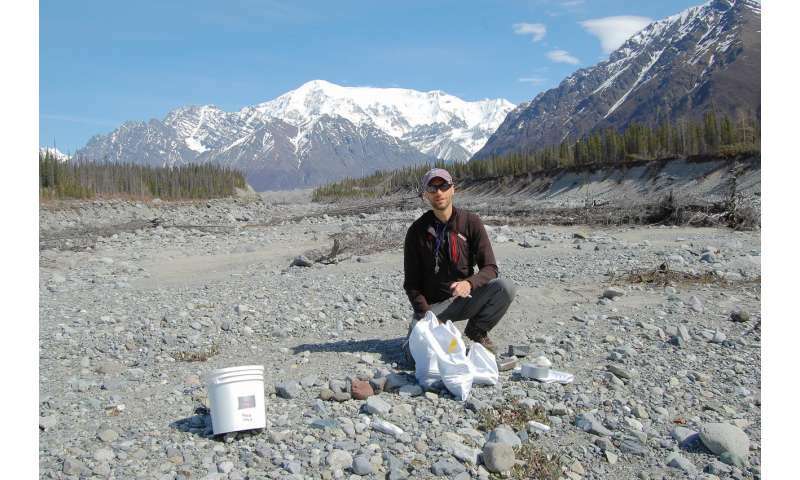 A new study by a team of geologists that includes Kansas State University's Matthew Brueseke has found that the Wrangell volcanic belt in Alaska's Wrangell-St. Elias National Park and Preserve is older than previously recognized and determined why its volcanic field has been persistently active since it formed about 30 million years ago. Brueseke, associate professor of geology, and colleagues Jeffrey Benowitz, University of Alaska Fairbanks, and Jeffrey Trop, Bucknell University, are principal investigators on collaborative research grants from the National Science Foundation to study the Wrangell volcanic belt, which stretches just over 300 miles from south-central Alaska to southwestern Yukon Territory in Canada. "The origin of the massive Wrangell volcanic belt has been a long-standing mystery as not much is known about how this volcanic arc formed," said Brueseke, lead author of "The Alaska Wrangell Arc: ~30 million years of subduction‐related magmatism along a still active arc‐transform junction," which has been published online by the journal Terra Nova. A volcanic arc is a location where an oceanic plate slides beneath another plate—the Pacific plate sliding under the continental North American plate in the case of the Wrangell volcanic arc, Brueseke said. Where the two plates collide is called a subduction zone, and the denser plate is pushed down to the earth's mantle at an angle. Subduction zones are characterized by widespread and hazardous volcanoes and damaging earthquakes. Subduction zones are also places where continental crust essentially forms, which is the layer of igneous, sedimentary and metamorphic rock that forms the continents. The researchers collected a variety of rock samples in remote sections of the national park—some places only accessible by light planes that can land in extremely rocky places—and studied them under microscopes back at their universities. Some samples were pulverized into a powder that was sent to labs that evaluate element and isotope concentrations to determine what melted to form the rock. Radiometric dating also helped the researchers piece together the history of the Wrangell volcanic field, including frequency of eruptions, relative ages of its different volcanoes, and the relationship between volcano formation and plate movements. The geologists' study produced new geochemical and geochronological data that covers the entirety of the volcanic arc's formation. Coupled with data from prior studies, the team was able to determine the age of the volcanic belt. "These new data helped demonstrate that the Wrangell volcanic belt magmatism initiated at least approximately 30 million years ago, which is several million years earlier than previously recognized," Brueseke said. The Wrangell volcanic belt also is home to some of the largest—by height and volume—volcanoes on Earth, including at least two that are historically active and considered hazardous by the U.S. Geological Survey, Brueseke said. The volcanoes have not had a major eruption of lava and ash this century, but have continuously released steam and small ash plumes since their formation. This continuous activity is unusual, Brueseke said, as a subduction-related volcanic belt usually has long periods of no volcanic activity. The geologists determined that location and geometry have a lot to do with the continuous activity and size of the volcanoes. "The location of the volcanic arc is above the edge of a subducting plate that is subducting at a low angle," Brueseke said. "The volcanoes are exceptionally large due to fluid generation from the low-angle plate, the slab-edge upwelling and crustal-scale faults acting as magma conduits." All that creates an environment that allows for increased volumes of magma, which can then move up through the crust along the faults and possibly erupt. More faults also equal more pathways for the magma. Because the volcanoes are so large, a major eruption could affect air traffic and would likely cause environmental changes, Brueseke said.